US Ambassador (ret) Margaret Scobey will be the 4th John Quincy Adams Foreign Affairs Distinguished Speaker tomorrow, Wednesday April 24, from 3:30-5pm in the Heritage Room of the Maxwell Library. 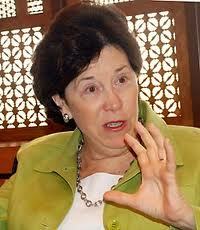 Ambassador Scobey served as US Ambassador to Egypt from 2008-2011, and was present during the fall of Mubarak. She also served as Ambassador to Syria, Political Counselor in Baghdad, and Deputy Chief of Mission in Riyadh, Saudi Arabia, as well as many other assignments. The BSU community, students, alumni, and the public are welcome to attend this event. Refreshments will be served. Sponsored by the Minnock Center for International Engagement. For more information, call 508-531-2421 or 508-531-6195.